The Middle Fork of the John Day River is one of the most active locations for river restoration in the Pacific Northwest. Since the Middle Fork Intensively Monitored Watershed was established in 2008, more than 40 restoration projects have been constructed on the Middle Fork and its tributaries. More projects are being planned. The projects are aimed at improving salmon and steelhead habitat, with the ultimate aim of recovering these species in the Middle Fork. 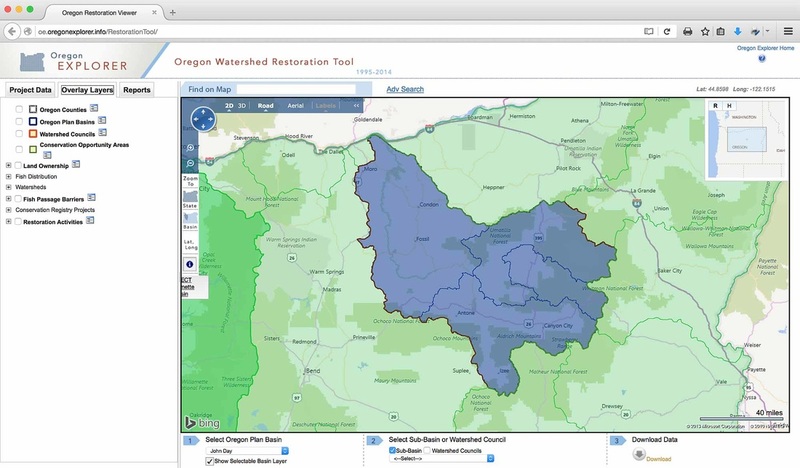 To learn more about the restoration projects happening in the Middle Fork, click on the map below, which will take you to Oregon Explorer’s Oregon Restoration Viewer. Select ‘John Day Basin’, ‘Middle Fork John Day’ subbasin, and then select the categories of projects you’re interested in. There are six main categories of restoration: Channel Reco﻿nfiguration, Fish Passage, Flow Increase, Grazing and Upland Management, ﻿In-stream Habitat Enhancement﻿, and Riparian Fencing and Planting﻿. The Middle Fork John Day IMW measures the effects of these restoration projects on physical habitat and fish, both at the local (project site) scale, and at larger scales (Middle Fork watershed and beyond, into the Mid-Columbia basin as a whole). For the most recent updates on new and planned restoration projects, be sure to check out our News page, or follow us on Twitter. Click on each restoration category to learn more and see examples of highlighted projects for each type.